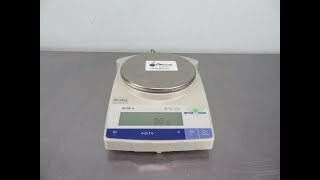 The Mettler Toledo Balance GB1501-S provides precision weighing for with a segmenting and weighing types ideal for gold weighing. This MT Balance features rugged construction, and leveling feet so it can be placed where you need it. The low profile design of this analytical balance has a maximum capacity of 1510g, with a readability of 0.1g, and a linearity of 0.1g. This lab scale has 3 different weighing units that can be displayed in the weighing mode, from a list of 14 different units. The balance is equipped with a RS232C interface for attachment to a peripheral device. This Mettler Toledo Balance GB1501-S has been fully inspected and calibrated with our in house weights. All of our lab equipment comes backed with our standard warranty. Should you have any questions, please don't hesitate to contact us.